The Black & Decker 2-In-1 Cordless MULTIPOWER Vacuum Cleaner delivers up to 60 minutes of cordless cleaning on a single charge*. 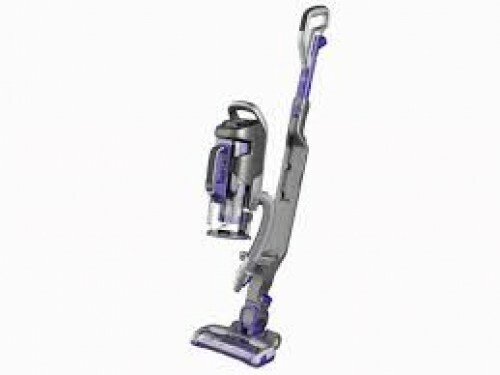 This powerful, versatile vacuum cleaner will help you to clean your entire home. It quickly converts to a handheld vacuum for those hard to reach spaces and stairs. This vacuum is ideal for pet owners, the special anti-tangle beater bar lifts dog and cat hair with ease. And a cotton-fresh scent is dispersed as you clean. Other features include: enhanced pivot steering, self stand mechanism and LED Lights to illuminate the floor head and surrounding area. 60 minutes of battery runtime achieved with lowest suction power setting. 15 minutes achieved at highest suction power setting.